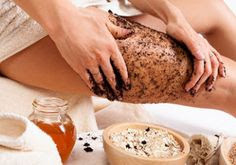 After enjoying your cup of COFFEE, you can use the extra for making a home made scrub to get rid of cellulite. Cellulite enemy #1 is caffeine, which tightens and provides antioxidants to the skin when applied topically. When applied religiously, it has been shown to reduce the appearance of cellulite—especially over time. Here, we combine COFFEE grounds with moisturizing, skin-soothing coconut or olive oil and a bit of sea salt for an extra exfoliating kick. By massaging this trifecta onto any problem area, you'll stimulate blood flow resulting in smoother, firmer skin. ~ Measure out the dry ingredients and combine in a large measuring cup or bowl. ~ Melt the coconut oil in the microwave if solid, and add to the mixture. ~ Transfer contents to a waterproof jar or container. ~ In the shower, apply your scrub to areas with cellulite. Massage the scrub onto skin in a circular motion before rinsing. Repeat every time you shower for best results. Diet is an important part of any treatment you will make, because even if you try out our method, if you keep eating unhealthy foods, it won’t work. Imagine building a house everyday, brick by brick and by night someone(that is you) comes and destroys what you have built in the previous day. This is what you would do if you would keep eating unhealthy foods and try our treatment in the same time, it is called self sabotage. We know it is not your fault, when you look around there are too many unhealthy choices and it is hard to keep a healthy life, especially if you are busy, but it is not impossible. Ditch fast food meals, processed foods, foods high in fat, white bread and pasta. Introduce more vegetables and fruits in your diet and you will be thankful for this for a lifetime. Water is extremely important in the process as it helps flushing the toxins out. Drink 2-3 liters of water a day! Water will also keep your skin hydrated! It is an important part in any transformation of the body. Exercise will help you tone the muscles and burn the fat faster. It is important to do it regularly so you increase your heart rate and improve the circulation.